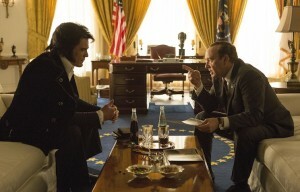 Kevin Spacey as Richard Nixon and Michael Shannon as Elvis Presley in “Elvis & Nixon”. The first image has been released for the upcoming film Elvis & Nixon. Kevin Spacey (who plays Frank Underwood in the upcoming third season of House of Cards to premiere on February 27, 2015) portrays President Richard Nixon, with Michael Shannon portraying Elvis Presley. Revolving around the meeting of the two, the story revolves around Presley showing up on the White House lawn to request a meeting with President Nixon, to become an undercover agent with the Bureau of Narcotics and Dangerous Drugs. Written by Cary Elwes (of The Princess Bride), Hanala Sagal and Joey Sagal, the film is produced by Elwes brother Cassian, as well as Holly Wiersma and is directed by Liza Johnson. Alex Pettyfer as Jerry Schilling, Colin Hanks as Egil Krogh, with Johnny Knoxville, Sky Ferreira and Tracy Letts. Comments for First Look at Kevin Spacey as Richard Nixon in “Elvis & Nixon” are now closed.